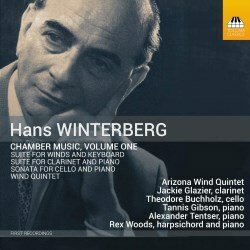 Prague-born Hanuš Winterberg studied in the city with Fidelio Finke and Alexander Zemlinsky, and many years later with Alois Hába, but thereafter his complex life story - told with scrupulous clarity by annotator Michael Haas, than whom few can possibly be better placed to elucidate the complexities and traumas involved – reflected the dualities, banishments and crises of the Second World War and its aftermath. Winterberg, whose life indeed constitutes, as Haas writes, a ‘strange tale’ is also a product of his linguistic times. Born Hanuš, he became Hans in Bavaria where he lived the second half of his life and it is to Bavarian Radio’s credit that they documented his music in numerous performances, though these recent readings derive from Arizona, about as far removed as possible from the national, political and ethnic turbulence that Winterberg’s life both reflected and incarnated. For those keen to know about the music and less so the life – though I strongly urge a reading of Haas’ biographical note – this is volume one in a sequence of recordings of chamber music written between 1944 and 1959. Of these pieces one, the 1959 Suite is heard in two versions; one for winds and harpsichord and the other for winds and piano. The instrumentation for flute, oboe, clarinet, bassoon and the keyboard instrument offers a startling introduction to the composer. The incessant ostinati and polyrhythms reach almost zany heights, the tenor of the music alternately refined or gruff, sonorities high or low, like a dysfunctional musical family in action. True, there’s a mordant, sepulchral, indeed funeral tread to the central slow movement with a winding Stravinskian line evoked. The finale reprises this impression, but the remarkable success of the music is that influences sound thoroughly absorbed and personality is striking; obsessive repetition, rhythmic energy, and military-sounding calls to arms. Of the two versions I prefer that for harpsichord as its sonority accords better with the edgy, metallic coil of the music. The Suite for Clarinet and Piano dates from 1944 when the composer was living – precariously - in Prague. The piano’s ostinati foreshadow those in the Suite and the clarinet’s edginess and unease are only partially subdued by the spare Francophile precision of the slow movement. The Cello Sonata is strongly argued, even aggressive in places but expressive too. To some there may well be echoes of Hindemith. There’s an especially touching theme in the slow movement to offset some of the more outré devices; the finale, meanwhile, is the most extrovert of the three movements, with gleeful syncopation, jazzy phraseology and – a Winterberg trait – rather obsessive elements. The final work is the Wind Quintet which offers a sense of ironic distancing in its employment of a German children’s song though the second movement’s very quirky pesante qualities are decidedly Czech in orientation. In the finale he returns to the children’s song and tests it to breaking point via some frenzied deconstruction and demolition work. This previously little-known Czech composer emerges as something of an iconoclast in these works. They’re played with biting resonance and power by the excellent instrumentalists. Sometimes critics note that they look forward to the next volume in a series but with a certain weary and detectable sense of duty. Not here: I’m keen to encounter more Winterberg.